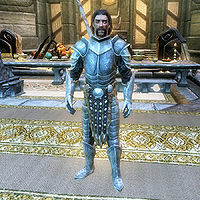 Due to his fame, Olaf was eventually named High King of Skyrim. However, his reign, which started in 1E 420 and lasted 32 years, saw its share of controversy. Notably, the bard Svaknir wrote a scathing verse decrying him as a fraud and a tyrant. Olaf responded by imprisoning the bard and destroying every copy of the verse which could be found. Ancient bard texts, perhaps inspired by Svaknir, claimed that Olaf and his men came upon a weakened Numinex and captured the dragon without significant effort, and fabricated the orthodox tale to ensure his place as Jarl and possibly to aid in his bid to become High King. An effigy of Olaf is ritually burned in Solitude as part of an annual festival known as "The Burning of King Olaf". However, Olaf is still remembered in Skyrim for reuniting the province after the War of Succession and for conquering the Reach. In 4E 201, in an effort to recover King Olaf's Verse, a lost part of the Poetic Edda, Viarmo the headmaster of the Bards College had the Last Dragonborn plunder Olaf's tomb in Hjaalmarch to find it, and thus earn membership at the College. The Dragonborn purportedly fought the draugr that once was the High King of Skyrim. For game-specific information, see the Skyrim NPC article and the creature article.